We can very easily get caught up in the monotony of what the weather's going to do (it's a national pastime in the UK). But these breathtaking images, from some of the finalists in the 2016 Weather Photographer of the Year competition, serve as a powerful reminder of just how beautiful and awe-inspiring extreme weather conditions can be. Over 800 photographs were submitted to the competition, run jointly by the Royal Photographic Society and the Royal Meteorological Society, with judges whittling those down to a shortlist of 23 striking images that capture a wide range of jaw-dropping meteorological events. The judging panel is now asking for photography fans to cast their vote for their favourite image, which you can do by clicking here, with the last votes counted on August 28. 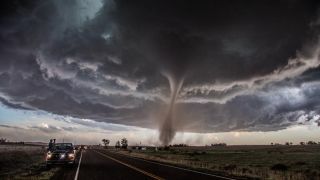 The image above was taken by Tim Moxon, on the plains of Colorado near the town of Wray, which experienced one of the most photogenic tornadoes of the year.